Issue #33 of Martin Arlt's wonderful, Mad Scientist magazine is now available to pre-order )or, if you are attending G-Fest you can pick up a copy there). 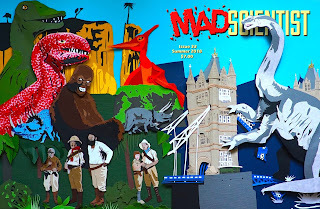 The issue is devoted to dinosaurs and features a wrap around cover that I created as a 3-D cut paper piece featuring the cast of The Lost World (1925). You can view the full contents, and also order, here.